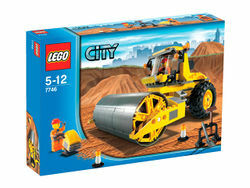 7746 Single-Drum Roller is a City Construction set released in 2009. It includes 208 pieces to assemble a single-drum roller with accessories and two of the first construction worker minifigures. This is a description taken from LEGO.com. Please do not modify it. Build new roads for LEGO® City! LEGO® City is always growing, and right now it needs new roads! With its massive drum, the construction roller flattens soil and asphalt to make safe roads for city vehicles to drive wherever they need to go. Roller drum spins to flatten the soil and the front end pivots with every curve of the road! Includes 2 construction worker minifigures and accessories! Measures 7 inches (17cm) long! Facts about "7746 Single-Drum Roller"
Build new roads for LEGO® City!